To all the angry people out there who burned and looted your neighbor’s businesses to the ground in Ferguson, I got news for you. I don’t feel sorry for you and neither do my white kids. Here’s why. You rap about “the struggle” and you carry it around on your shoulders like a badge of honor. You want everyone to know you’re black and angry, that we should all be afraid of your knock out games and your palatable hatred. I don’t care about your hoodies or your $150 sneakers, I care that you’re rude to me in the parking lot and in the stores, you give me ugly looks when I smile at you, and that you are racist. And let’s talk about that struggle for a moment, shall we? For 15 years, I went without any help raising my kids. I remember in desperation going to the health department to try and get food stamps. Everyone who worked there were black state employees. They not only didn’t like me, they didn’t want to help me. They let me know I didn’t belong there simply by the way they didn’t look at me and didn’t even want to touch my application. I had one income to feed my kids, put a roof over their heads, and pay my car payment. And it wasn’t working. The car was taken and there wasn’t much money left from my meager check for food and utilities once the rent was paid. But I had a job, which precluded me from getting food stamps. I didn’t qualify for Section 8, or maybe I did but the black ladies in that office didn’t care to tell me about it. They made it clear they were not going to help me by offering any unsolicited advice. I was the enemy. I was white. In fact, they could barely stand to look at me. I wasn’t in that dingy, rundown government building looking for a hand out that day so long ago, I was looking for help. Help that I never got. So we struggled on for years. While the ladies I worked with went out to lunch for a treat on payday, I remember getting my paycheck and flying across town on my lunch hour to pay the power bill in a race to beat the guy in the white city van from turning off my power. Today, my children and I laugh about it, but we hated white vans. White vans came and turned off your electric or your gas. And if it happened at Friday at 4:00 p.m., well you were going to have a long weekend. We also never answered the phone if we didn’t recognize the number–might be a bill collector. When I would get my federal tax return, I’d buy the $1,000 car that was just shy of falling apart. It would usually last exactly a year before I had to buy the next $1,000 car. I never went anywhere on the weekend and never drove farther than 20 miles. I didn’t know if the car would make it and I never had the gas to spare. I would be exhausted from working all week at a high pressure job, but Saturday morning would find me running to the discount grocery store at the crack of dawn while my teens were still asleep so that we would have breakfast. By the time I got paid, you usually couldn’t find a shriveled raisin rolling around in the empty cupboards to eat. I made stacks of pancakes, cheap boxed cakes (less expensive than buying cookies or Little Debbies), I peeled bags of potatoes and made potato soup, home fries, and mashed potatoes. My dollar had to be stretched and it didn’t matter if I was tired and it would have been easier to go to McDonald’s. I couldn’t afford double cheeseburger meals for three. I never had new clothes, went to a nice place to have my hair cut, or even drove a decent vehicle, but we made it. For my kid’s part, they never had the luxury many teens in America had, that is the luxury to feel secure. They didn’t get designer clothes or $150 sneakers or a car handed to them when they turned 16. No, they went to work. We never had cable TV, internet connection, or cell phones. We couldn’t afford them. Today, you can get an “Obama” phone that poor white people like myself had to pay for while we went without. So don’t tell me about your struggle and why you are so angry. Was I angry? You bet I was. I was angry at a system that only helped people that wouldn’t help themselves, who talked a good game about caring about children and single women, but in reality, no one cared whether we ate, particularly the government. I was tired of chasing an ex-husband down through the Department of Social Services so they could make him pay his child support. And I couldn’t afford an attorney even though I worked for a slew of them. But I didn’t set their businesses on fire. I didn’t scream about the injustice of it all. I just tucked my chin in and got through it. I grew up in an area where most black people had more money than my family ever did. They had government jobs that paid them $70,000 or more. They were teachers, lawyers, and tax professionals. I was uneducated, white, and swimming hard to stay above that poverty line. I’ve had bosses who were black. I have one now. I just never see their color, just their success. My son was so scared by our struggles that he determined to be the first person in our family to have a college education. He grew up in an era that told him he could be successful if he had an education. No one bothered to tell him, “Sorry son, we shipped most of the jobs in this nation away a long time ago through GATT.” That all those government handouts in the form of student loans was just a trick of hand. When you graduated, unless you were part of the small percentage, you were not going to find a job much less a profession that was going to pay you enough to live on your own and pay your student loans back. Not finding work after earning his degree, my own son joined the National Guard who, in exchange for his servitude, would pay a portion of his student loans while he struggled on hoping someone would hire him. My own child is now an indentured servant to the federal government. The same government that looks out for poor blacks and illegal immigrants, gives them food stamps, subsidized housing, free health care, and practically free higher education. Am I angry? You bet I am. Slavery exists today, only now it is in the form of federal student loans for young people such as my son, who must compete with his hands tied behind his back and a tide of millions of illegal immigrants who are also getting free rides. Then there are the millions of white people like me who cannot afford health care or even Obama care. When I am sick or my daughter is sick, we can’t go to the doctors. We can’t get antibiotics. And now I will have that penalty hanging over my pretty little head that I will also not be able to afford to pay. So to the looters who think you got the short end of the stick just because of the color of your skin, I’ve got news for you. You didn’t get the short end of the stick because of your skin color, you got a free ride. And it has made you ungrateful, greedy, and void of any values. 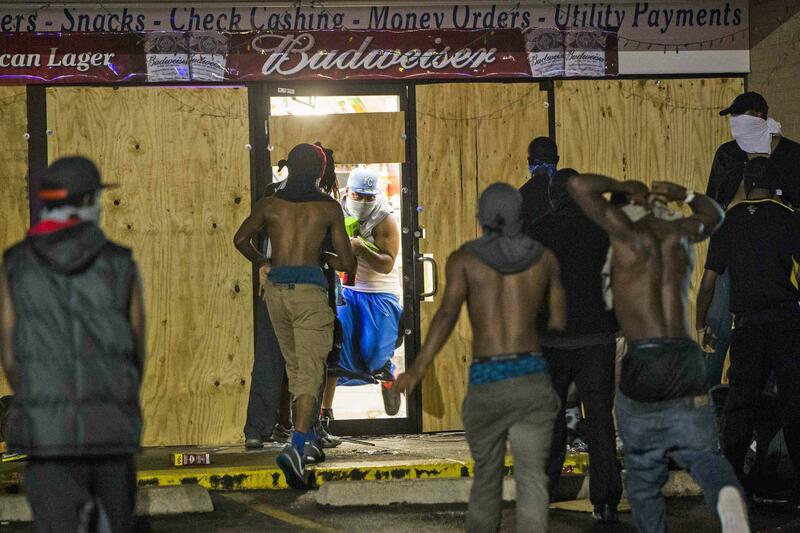 Those criminal thugs looting, race baiting, and burning down their neighbor’s businesses came from a families that didn’t teach them the skill of how to survive in a world that is against them but rather how to remain in the system and play others. They didn’t teach them if you can’t afford the expensive sneakers, you don’t buy them–or steal them. Tough times require tough people. And the tough times are just beginning for this nation. I cannot stand the police state we are living in any more than my fellow black Americans in Ferguson and across this nation. I watched this very same police state in action with disgust this Black Friday. Patrol cars were parked all over my small city in the medians amid the weeds, poised with their radar to harass people as they went about their business of Christmas shopping. It makes me sick and it makes me angry. Why in God’s name are our own men in blue, ones we pay for, hiding all over the city trying to catch someone going 10 miles over the speed limit? Then I got on the interstate and there were at least three state troopers systematically pulling Thanksgiving travelers over. It makes my blood boil. And I still want to know why the officers who responded to a bank robbery here in our little town a few months ago were depicted in a photo in our local newspaper wearing camo rather than blue uniforms. The police state is about control and I agree with the sentiment of the black citizens of Ferguson–it is out of control. But the race baiters of Ferguson picked the wrong person to use as a poster boy of police brutality. This “child,” as the media keeps referring to him, was 18 and he was nothing but trouble. He was a thug who strong armed someone and tried to take an officer’s gun from him. When my son was 18, he was mopping up the floor of a sticky ice cream parlor for minimum wage and my daughter was swinging late shifts at the coffee house. No, this white girl doesn’t feel sorry for him. I lived through busing and I lived through racial riots in my school. In fact, I went to school where I was the minority. From this experience, I met many fine black people that I call my friends. And I can also tell you that many more black people are racists than their white neighbors. While we were being taught to love all people, so-called black leadership was fueling the flames of hatred toward white people. And they have succeeded. There are consequences in life to bad behavior and in the case of this young Ferguson man, his actions cost him his own life. Your enemy isn’t me because I am white, it’s the ideology that your government is there to take care of you and to right all the wrongs in this world for you rather than you learning to take care of yourself. No young people, stealing plasma TVs isn’t going to make your life better any more than perpetuating violence on innocent white people who have their own struggles, such as myself, is.